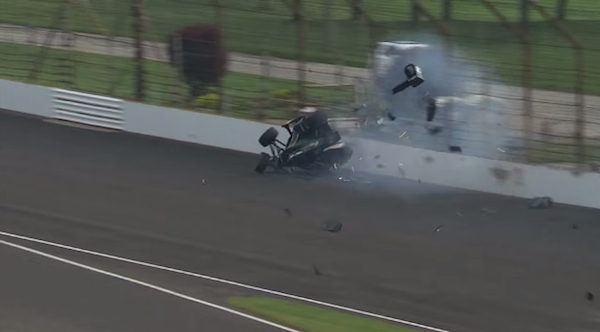 IndyCar has taken action after Helio Castroneves, Josef Newgarden and Ed Carpenter experienced eerily similar airborne crashes during practice sessions ahead of the Indianapolis 500. To help prevent flips and slow the cars down a bit, the race series lowered the maximum amount of boost pressure and mandated all cars use their respective Honda or Chevrolet aero kits for qualifying this past Sunday. The IndyCar series originally was going to allow drivers to run 140 kPa of boost pressure during qualifying and was also allowing teams to modify the Chevrolet or Honda aero kits to lessen downforce and increase average speed. However following the crashes, the series forced teams to use the race-mandated 130 kPa of pressure and the full aero kit configuration, creating more downforce and in theory lessening the chances of yet another frightening upside-down, airborne wreck. The rules certainly slowed the cars down and made for a somewhat less exciting qualifying session, but that’s a very small price to pay in the name of driver safety. The session ran problem free, apart from being delayed for rain until Sunday, and Scott Dixon ended up on pole with a lap of 226.7 mph. I can’t believe they did not see this coming. NASCAR has flipped for years till they put in flaps and fences on the roof. There is little they can do at this point. What they did this weekend has done little to help as another flipped today. Air over the side pods turns them into wings. Get backwards it is even worse. They will have to rethink this one. Number one rule anymore with any race car aero package. Turn it sideways and backwards to see what it will do at speed. It is only a matter of when not if when it will be in this position and better in a wind tunnel to find out what it will do.